Relax. You don’t need good punctuation to work at Great Clip’s. I see a lot of apostrophe abuse when I’m out doing errands, but I cringe a bit more when I see abuse at chains. This sign at a local Great Clips is probably replicated at all 3,000 locations. Relax. I sent them a heads up. 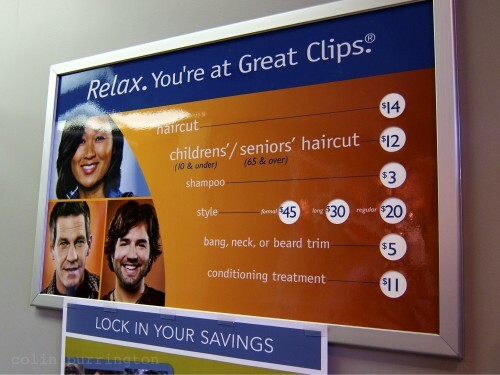 Tagged with children, great clips, hair cut, salon. Childrens’ ???! I CANNOT RELAX!!! I’m not sure what they’re trying to say. Is it Child’s/Senior’s Haircut OR Children’s/Seniors’ Haircuts? (If “senior” can be used as a noun at all?) The concept people better get this one sorted.